Sometimes there is a card that turns out better then you pictured it in your head! this was definitely one of those! I loved coloring this sweet image and I don't use very many circles and I love the cards I have been seeing with half circles! Wanted to use different colors since I have been on a purple and pink kick lately and figured some nice soft greens, yellows and blues would be perfect! 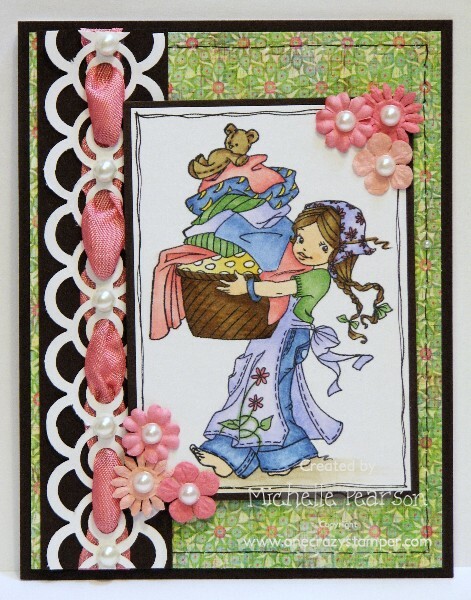 I used the sentiment from kraftin kimmie Goldilocks! I have to admit I go to that sentiment a lot! You still have a few days to enter our recipe challenge: One focal image, two dps and three embellies. 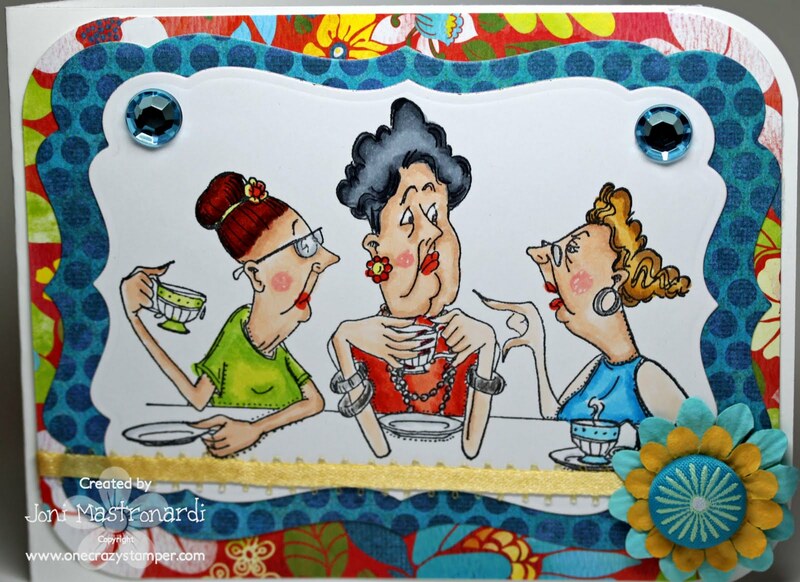 For today's card I have this hysterical image from Art Impressions called "Gossip Club." First I stamped my image with Memento Tuxedo black ink unto Xpress It cardstock. Then I cut out the focal image with a labels 17 Nestie and layered it unto Basic Grey Lauderdale dp. Rhinestones are from Bo Bunny Barefoot & Bliss Collection and Flower is Fancy Pants Beach Babe. Check out all Lora's new items at One Crazy Stamper! Hello a bit late on my post for today, I want to share a card I just made using Victory Kid available at the OCS Store from Whimsy Stamps. I colored my image with Distress reinkers also available at the OCS Store. 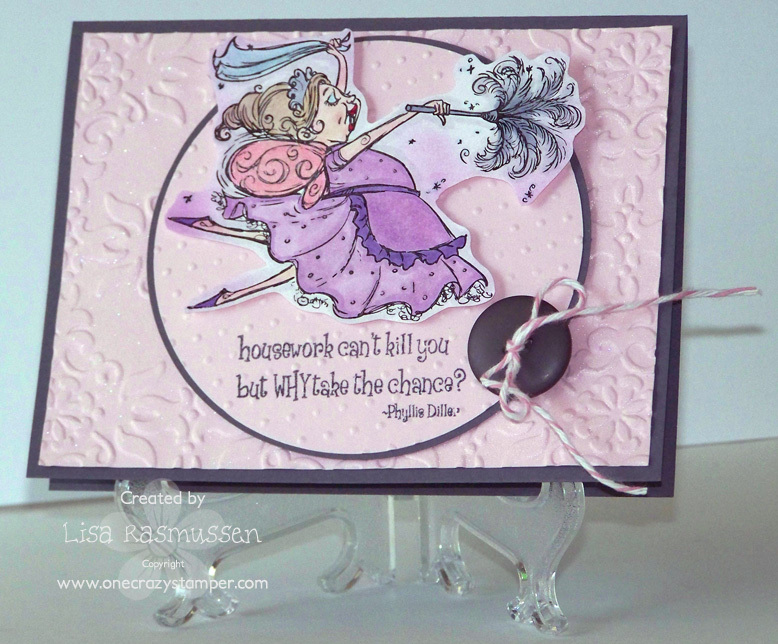 My sentiment is from Whimsy Stamps, these are the Party Mini Letter Seals also available at the OCS Store. I love these little circle sentiments. I think they look great on any card/project! Thanks for peeking in and don't forget there's still time to enter this months recipe challenge HERE!! Madge here for another “wonderful Wednesday”. 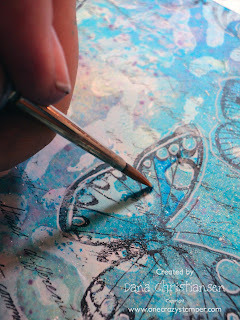 Today, I’m sharing a card made using an sweet stamp from Stampavie called ZOE GAZING AT THE BUTTERFLY by Sarah Kay. This must have been a popular one as I don’t see it in Lora’s store at the moment. I purchased it because the image was so sweet, and because my grandmother’s name was Zoe. A perfect combination! 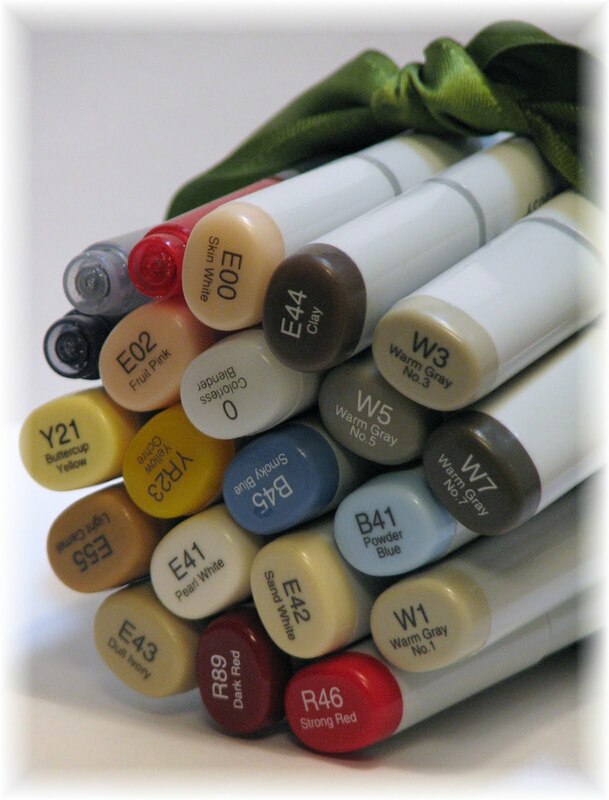 I absolutely love the Xpress it blending cardstock made especially for copics, the color doesn’t disappear, but remains bright and beautiful. I stamped my image using Tuxedo Black Memento ink, colored it with copics and then cut it into a rectangle, rounding the corners. 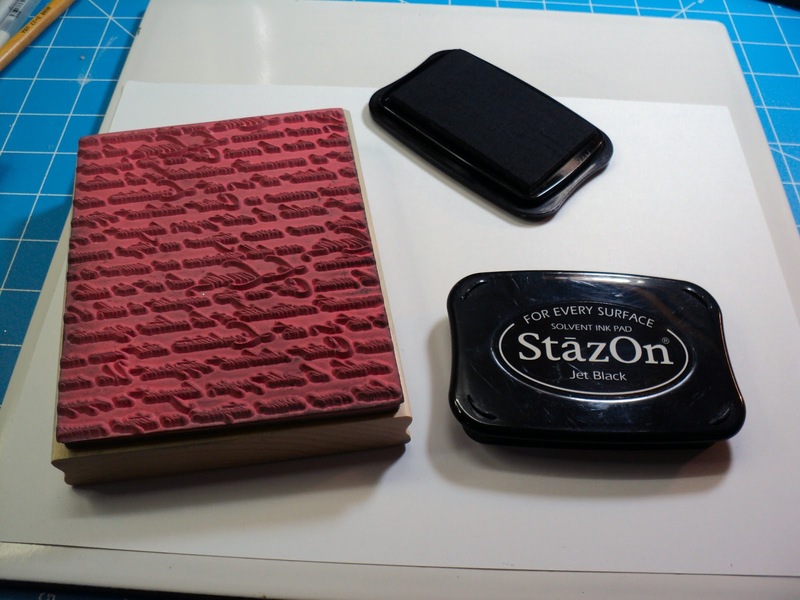 I backed it with a die cut from Marianne Creatibles and backed that with a 6 x 6 Webster’s Page. I then fussie-cut two side panels from a Webster’s Page and mounted it over top of the matted image. The butterflies and pearls came from my stash. I then mounted it onto a 6” square card base. 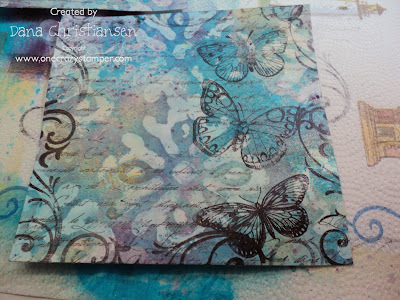 Keeping in the theme of our July Challenge at One Crazy Stamper, I used two papers from Webster’s Pages, One image and three embellishments (butterflies and pearls). 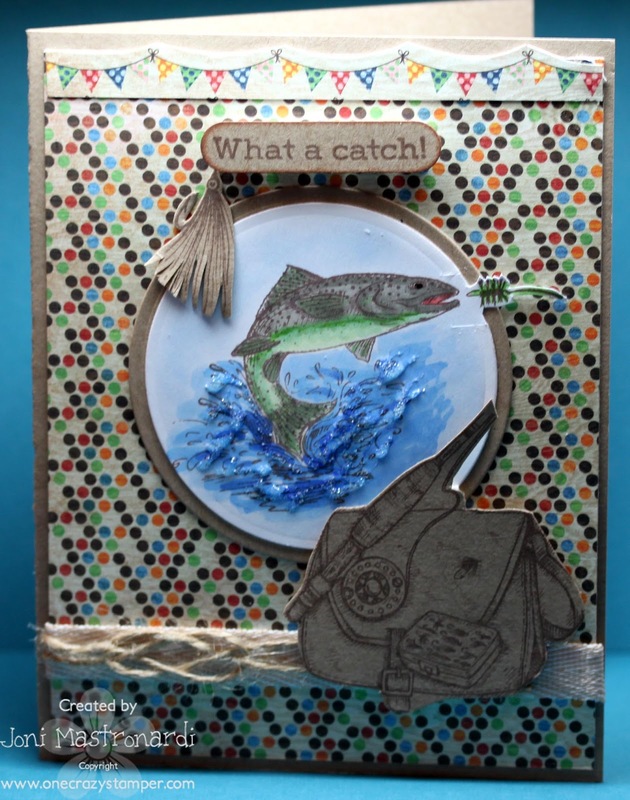 I hope you will join in on the fun at OCS challenge and post one of your creations for a chance to win OCS $$$. While this is being posted, Art and I will be enjoying sun, salt water, and fireworks. See you next week! That is one of the amazing images by Sarah Kay for Stampavie. This is the first time I've tried stamping (with my Memento Ink in Tuxedo Black) directly onto Designer Paper before coloring with my copics. That was stamped right on Bo Bunny Gabrielle paper (The other dp is not Bo Bunny). Granted, it is more like coloring on Georgia Pacific cardstock if you've ever done that. It soaks up a little more ink and does not blend near as nice as X-Press It paper but you can color on it. I was really happy with the final results and always LOVE to find new ways to use my copics. Here's a close up of my bow that I dyed with my Spun Sugar Tim Holtz Distress Ink by just running the ink pad directly over my seam binding. Then I misted it slightly with my mini mister to get a uniform color. That's all from me today. Make sure you come back tomorrow for more great inspiration from our marvelous team!! 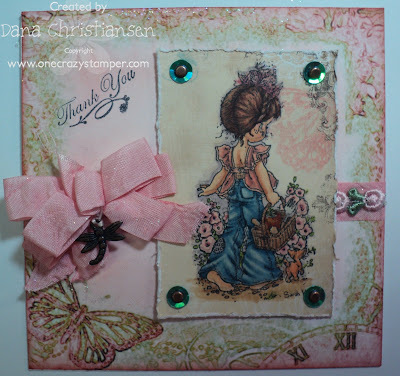 I'm sharing an adorable image today for One Crazy Stamper from Stamping Bella called Bye Bye Girl. This is an image by Mo Manning and it just had to be mine! 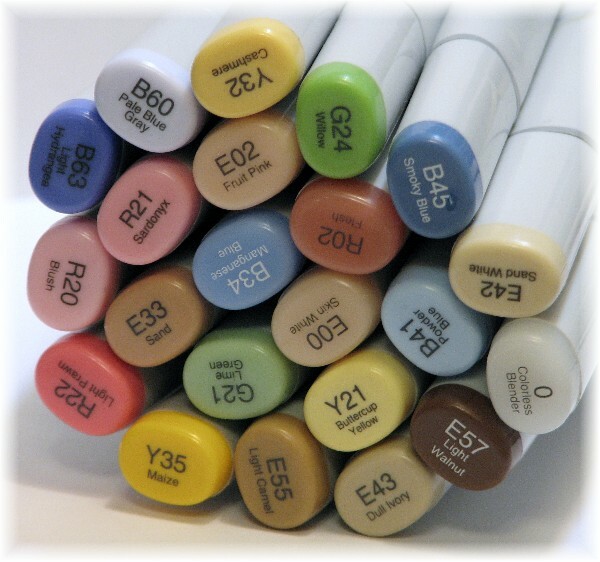 I colored my image with the Copic Markers pictured below. 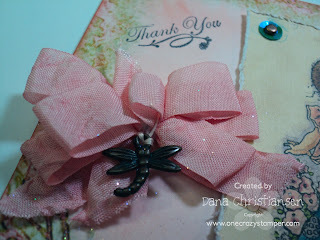 Other items used are Spellbinders Labels Five dies, Memento Tuxedo Black Ink and Prima Flowers. I hope she makes you grin! For my post today, I used the Backyard Birds set from Just Rite Stamps. 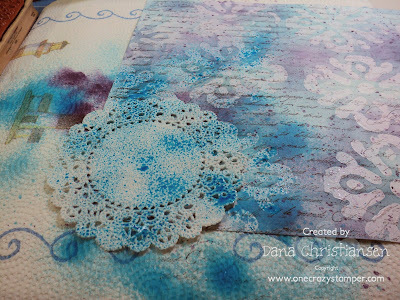 The patterned background paper is from the Gabrielle Collection by BoBunny is amazing. Because of the detail on the paper, I found it hard to come up with the right embellishments. I used the Cream Viva Decor Pearl Pen to fill in the main holes from the Fleur de Lis die cut that the main image rests on. is opened there will be lots more stuff to play with. Join us in the Recipe card challenge for the month of July for a chance to win an OCS Gift Card. 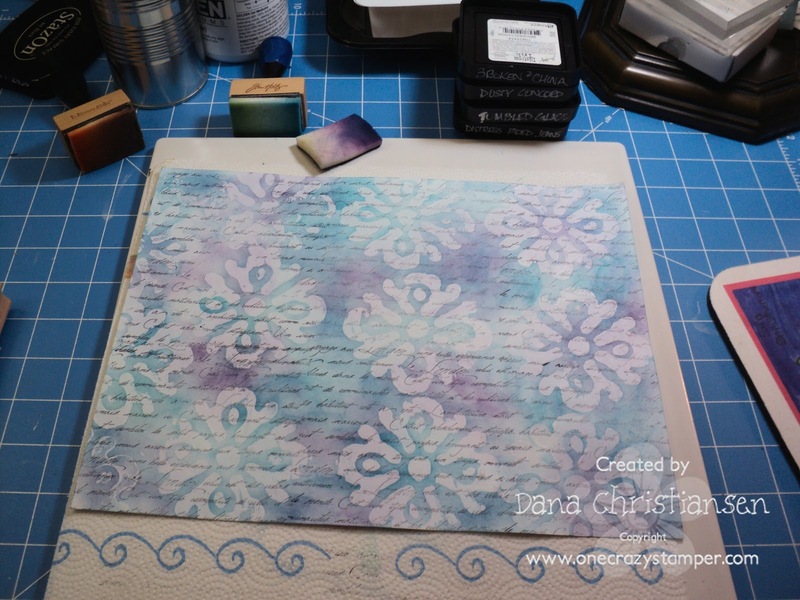 This month's Challenge at One Crazy Stamper is a recipe challenge. We want to see 1 image, 2 pattern papers, 3 embellishments. So get going! You have until the end of the month to join in. Only new projects (no back linking to old projects). You must link us in your post. You may combine with other challenges. I cut out a couple of other images and used them as embellishments. I also added some rope twine and tied a nautical knot. DP is Basic Grey Life's A Beach. 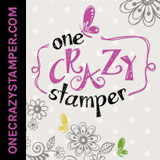 Check out all the new items at One Crazy Stamper! 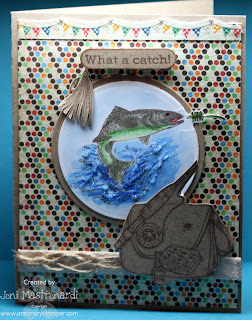 Hello it's my turn to share a creation with you, I have this card I made for the Whimsy Inspirations Magazine June Issue. She is Alice Chains and is available at the OCS online store. My sentiment is also from Whimsy and these also available at the OCS store, these Party Mini Letter Seals are perfect for all your cards!! The pocket watch is also Whimsy, this Time Flies set is super neat, it's a must have in your collection. I added crackle accents and distressed the edges. Thanks for peeking in and enjoy your day!! Hi all, Madge here once again for Wonderful Wednesday. Today I chose a stamp from Your Next Stamp called “Pierre from France”. Brings back wonderful memories of our visit to France and of the baguettes and Brie cheese (unlike any Brie you have ever tasted, because the French don’t pasteurize their cheeses)(at least not the ones that aren’t exported). This set also comes with a little dog and an Eiffel Tower. To keep with the recipe challenge at One Crazy Stamper, I’ve added 3 embellishments, (well maybe a couple more than 3), 2 designer papers and 1 image (well, maybe 2). I stamped Pierre with Tuxedo Black Memento ink onto Xpress It blend c/s, colored the image with copic markers, cut it out and mounted it onto SU Confetti Cream. I also used the Parisian Accents Spellbinders die, a MS border punch, and 3 dimensional accents by Joli. The Designer papers are Websters Pages. We are all getting very excited about Lora (One Crazy Stamper) opening a brick and mortar store in September…….it means lots more stuff to choose from!! 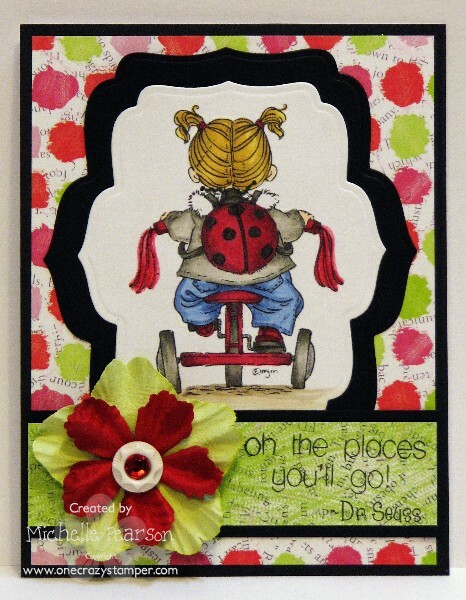 And a little birdie told us that perhaps Magnolia Stamps are going to be making a come-back. How exciting is that? In the meantime, join us in the Recipe card challenge for the month of July for a chance to win OCS $$$. Can’t wait to see what you come up with. 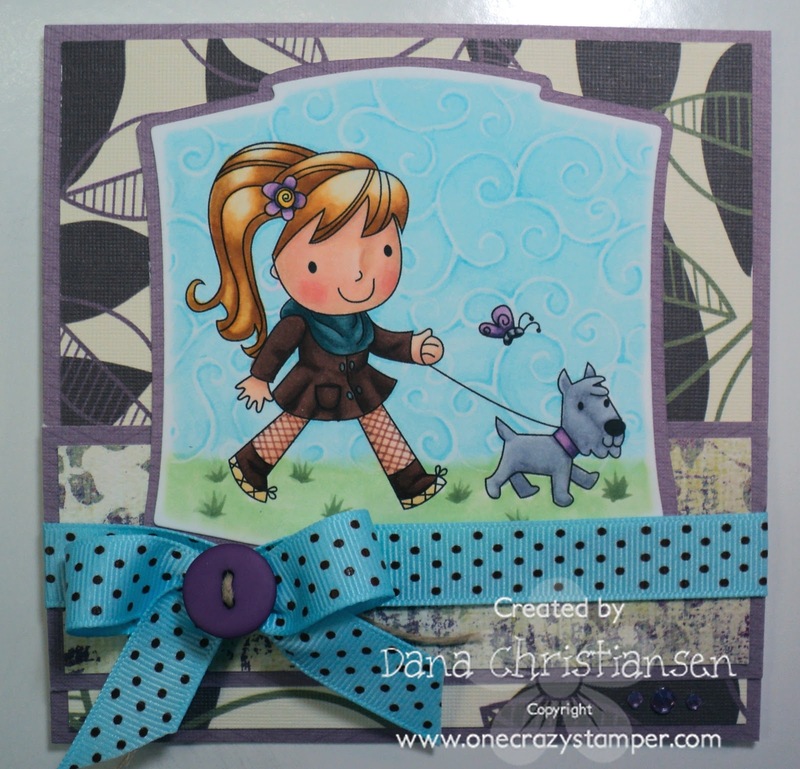 Dana here and look at this adorable stamp from Your Next Stamp!! 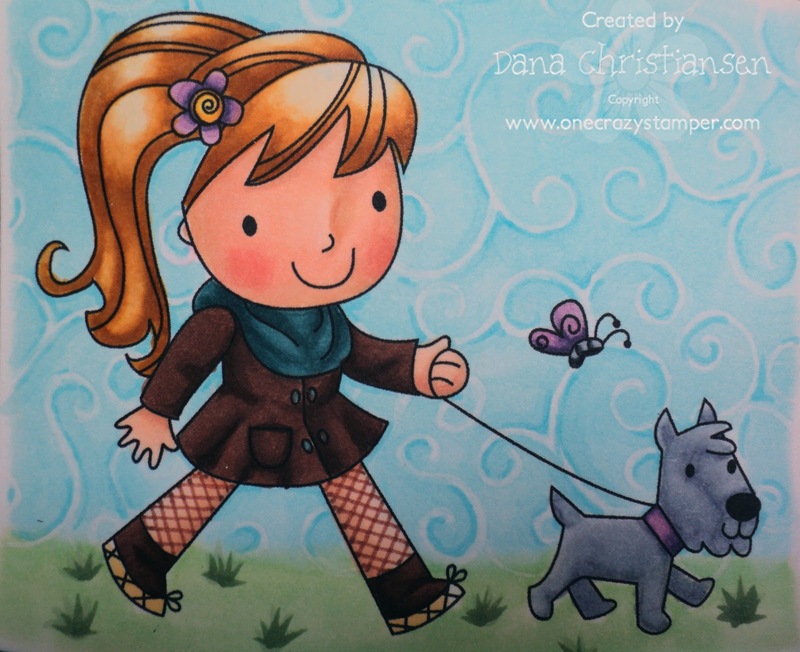 This fall cutey is Ellie Loves Walking her Dog. I played around with a few different backgrounds and I finally decided I like this one the best. I first created my sky and grass using the technique you can view here. Originally I had the clouds in but I knew I really wanted the swirls to show up to simulate gusty fall winds. The swirls were achieved by misting a swirl background stamp with colorless blender. I completely forgot to mention her cute little tights which were created with a sepia copic multiliner. My rhinestones in the lower right corner sure didn't photo real well, but they're there! Thanks so much for coming by to have a look! We sure hope you will join our recipe challenge this month. And remember to come back every day to see what the rest of our amazing team has in store for you! These ladies are TALENTED!! This image seemed appropriate for today's challenge....I've been quickly getting all my laundry/housework caught up a bit so I can spend Tuesday at CHA! 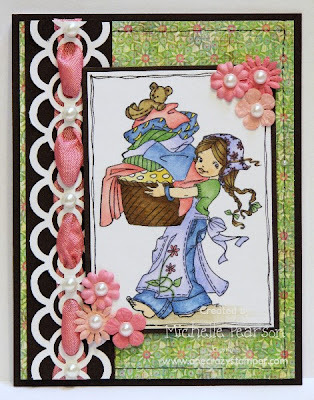 ﻿What a darling image from Belles'n Whistles to depict an everyday occurence of our lives! I used designer paper from BasicGrey's Sweet Threads collection.﻿ I kept the designe simple since the image is so detailed and delicate. I don't mind laundry....that is such a good feeling when everything is fresh and clean! Now ironing...THAT is another story!! Blech!! 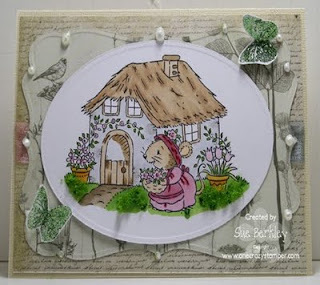 For my post today, I used this cute Cottage Mouse stamp by Stampavie; one of my favourite stamp companies. 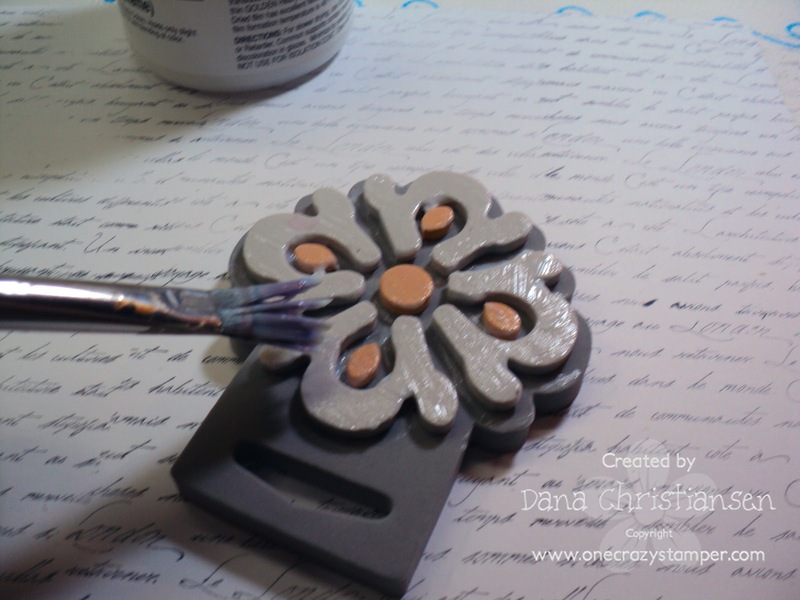 While you're playing, don't forget to check out Lora's store One Crazy Stamper for some amazing products and prices. Hi all! Remember last week I told you I LOVED whimsy stamps? Well I really, really do!!!!! 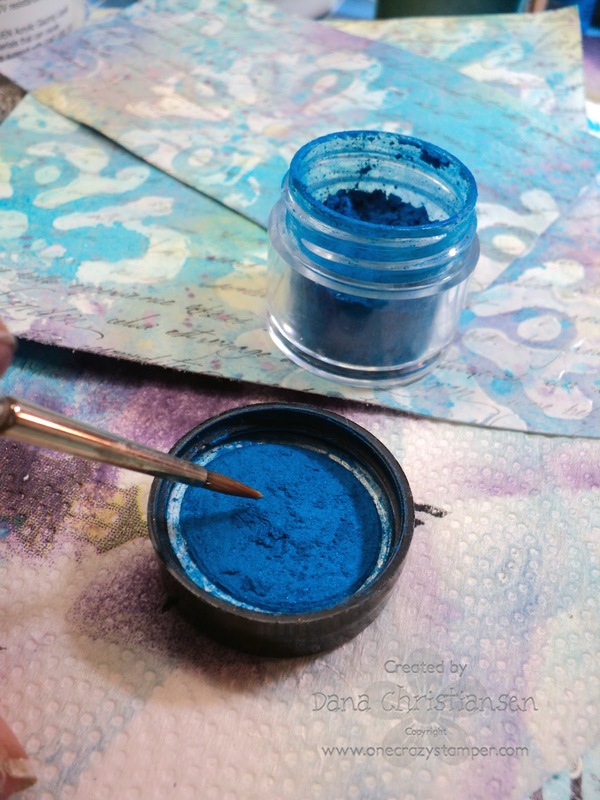 I have been drooling over the Kenny K line for awhile but I am always reluctant trying new companies because I know I will fall head over ink pads for them because I have yet to find a stamp company I haven't become addicted to! She was super fun to color and I added a little felt to her too (the flower and heart) to make it a little more funky. Hope you enjoy!!! This month's Challenge at One Crazy Stamper is a recipe challenge. We want to see 1 image, 2 pattern papers, & 3 embellishments. So get to cookin good lookin! I stamped the image with Memento Tuxedo Black ink on Xpress It Cardstock. I cut out my images and popped them up with foam tape. I used a nestie to make a shaped cards and for the layers on my card. I punched the buttons from a 6 X 6 paper pad Fancy Pants Beach Bum DP. Check out all the fabulous new releases at One Crazy Stamper. 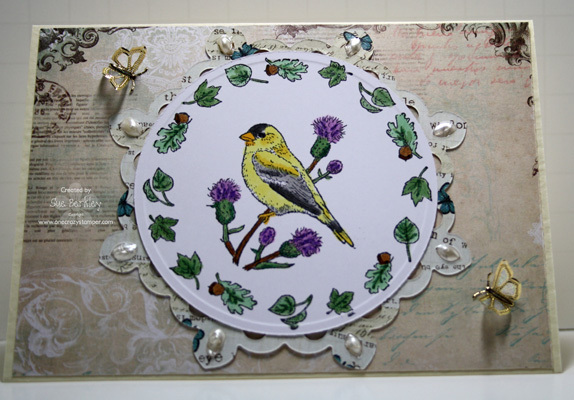 Hello it's my turn to share and I have this card using Garden Bird House from Meljens Designs available at the OCS Online Store. My stamp was stamped on X-Press it Blending Card stock with Memento Ink and colored with Copic Markers. A few flowers on my card and a pretty bow! Thanks for your visit! Hi all! Here it is wonderful Wednesday once again. If you were here on Tuesday, wasn’t that a fantastic tutorial shown by Dana? That gal has so much talent! She’s a hard act to follow! I’ve chosen to use a stamp from Your Next Stamp called “Anika from Holland”. My Mom was Flemish, and I remember her telling me of her father getting very angry with her for breaking her wooden shoes…….isn’t it funny what sticks in your mind? My Mom also had carrot red hair (natural), so I had some fun with this little image. I started out stamping Anika onto Xpress-It Blend Cardstock with Memento Tuxedo Black ink, coloured her with Copic Markers. I also added a little pattern to her dress with my Copic Multiliner. 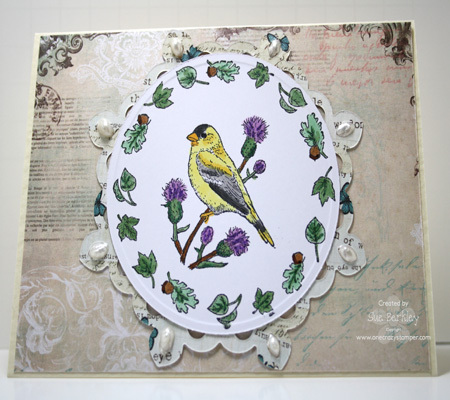 Spellbinders Oval dies were used to die cut the image and the mat. The Designer papers are from Bo Bunny, and the mats used are from SU. A Martha Stewart punch was used for the heart border. Two buttons were added from my stash, adding additional coloring added with a Sakura Stardust Glitter pen. Dana here and sit back with a cup of something, because it's a long one!! It's my turn at bat to bring you a tutorial and you would think I would do something with copics, right? But lately I have been having so much fun playing in my art journal and a big part of that is creating backgrounds. It is actually creating backgrounds for some jewelry pieces I was making last year that got me hooked on cardmaking to begin with. I started by covering a 8x10" piece of paper with a script stamp but you could use anything. Can you see the little peaks?? The next part is so much fun and magical to see the pattern pop through. 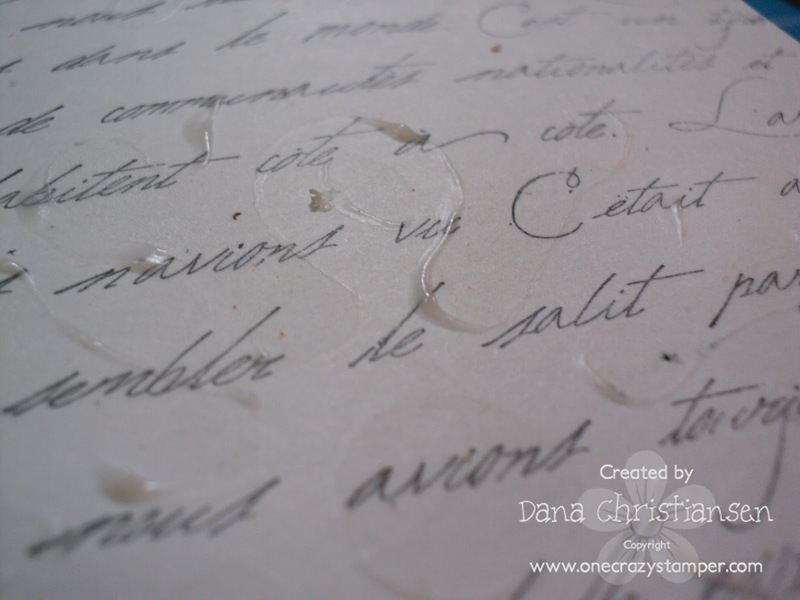 You can also use clear embossing powder but that will make the text under the stamp shiny. This process keeps the text uniform throughout the whole piece. 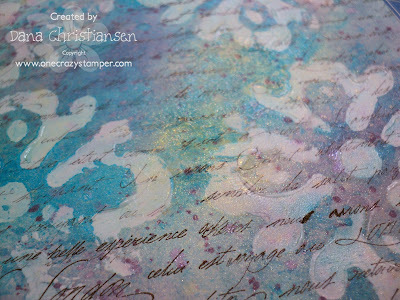 Start to blend in some Tim Holtz Distress Inks using the blending tool. I've used Dusty Concord, Broken China and Tumbled Glass. Check out the gorgeous masks that Lora is carrying!! I must have them all ; ) Next I used Glimmer Mist spray. I used Gold but so many colors would've worked. It's really starting to look like a piece of batik fabric now. 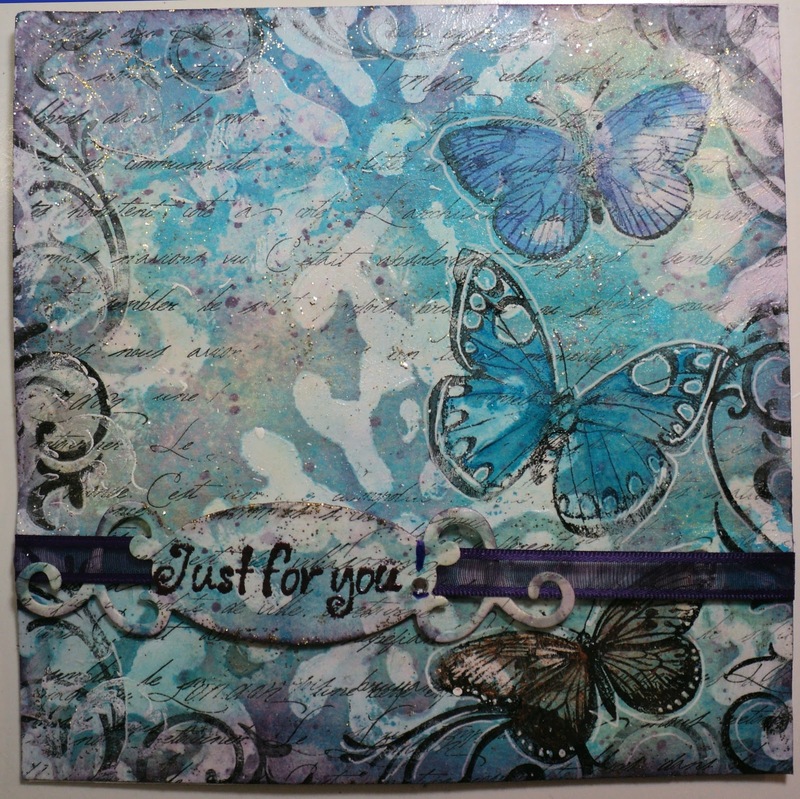 Next I added some butterfly stamps and scroll stamps again with StazOn after cutting my paper down to 5 1/2 x 5 1/2. That's the size cards I most commonly make and I wanted the scrolls to be around the outside. Those blue scrolls you see are acutally on the paper towel that was under my cardstock. Stick with me, we're almost done.. lol! 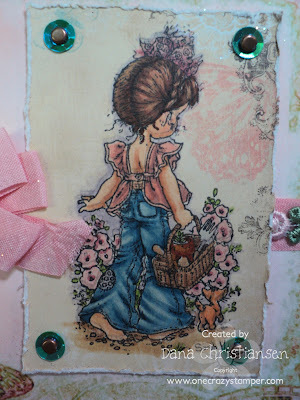 The only things left was to distress the edges and add the sentiment from Amy R.
Check out some of the new gorgeous shapes Lora is carrying from Spellbinders!! I added some simple outlining here and there with a white gel pen to really make the butterflies pop out.